In this tale, Harry “Bunny” Manders finds himself badly in debt. Bunny must pay off a loan to an unscrupulous moneylender, Alexander “Shylock” Cardinal, or else lose all of his assets, or worse his life. Bunny puts his faith in his best friend to save the day but can even Raffles pull off a job at such short notice – and raise such a large sum of money? ‘This story is not only a joy because of the wonderful characterizations of Raffles and Bunny, but the rest of the ensemble is both amusing and full of personality. 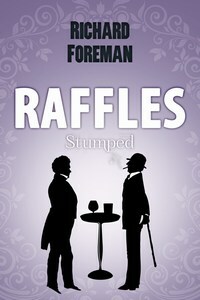 I found myself often laughing with Raffles and cringing with Bunny at the various people they encounter. The casual mention of real people like H.G.Wells, Winston Churchill and the famous sportsman C.B.Fry – here a friend of Raffles – naturally brings authenticity to the story, and you really do feel like you’re witnessing history first hand.’ Dawn – The Baker Street Babes. Richard Foreman is a literary consultant and publicist. He cut his teeth in the book trade as a bookseller, before founding Chalke Authors.